NBC Entertainment today launched a "Saturday Night Live" app which allows fans to browse a catalog of the show's entire forty season-run, eventually learning each user's particular tastes and favorites and subsequently curating videos and sketches for them to view (via Entertainment Weekly). 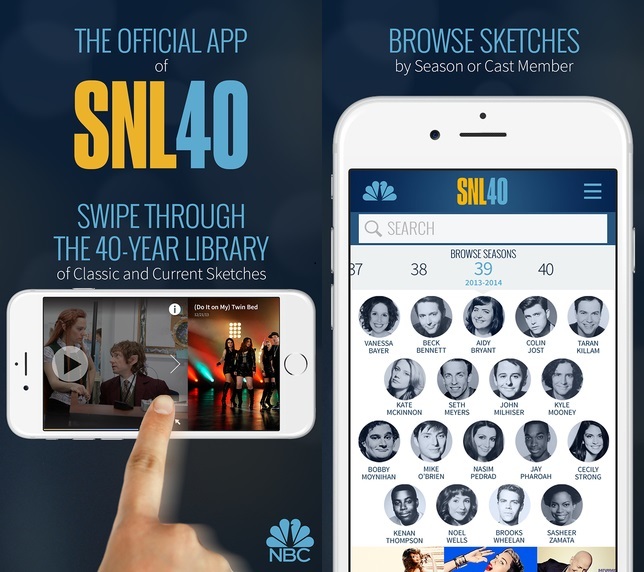 The app launches a few days before the show's big 40th season premiere this Sunday, and NBC promises the impressive app contains nearly every single sketch the show has done over the decades it's been on the air, amounting to about 5,500 sketches from 800 episodes. The network also says it'll keep the app updated beyond the 40th season premiere with new skits and moments from the newest episodes being uploaded to the app following each new episode of the season. Perhaps the most impressive aspect of the app is that, once it gets a feel for the kind of sketches, music videos, and parody commercials a user enjoys watching, it'll begin personalizing the experience for each user. Those wanting to search for particular sketches, actors, or characters can do just that, too, if looking for a particular aspect of the long-running sketch comedy show. One of the current cast members, Kyle Mooney, voiced behind-the-scenes support of the app, telling Entertainment Weekly the cast and crew plans to use the app to more efficiently research past sketches when working on new material for the show. As a plus, the SNL app also comes with a keyboard that, when granted access within an iPhone's General settings tab, allows users to send SNL-themed emojis to friends. Update: As several readers have pointed out, the app appears to be U.S.-only. Some UI issues and Facebook login aside, I find the app to be quite remarkable. It is truly filled with a ton of contents and does not require cable/satellite subscription like so many similar apps do these days. The app features a prominent banner ad on the bottom, but I haven't encountered any video ads (minus SNL parody ads) so far. Now just stream SNL and forget the broadcast network. No native Apple TV support? Really lame. It's still missing a lot of sketches.